Bic Promotional Non-Adhesive Logo Notepad Cube is made from paper. 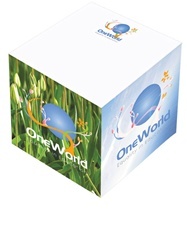 Personalized Notepad Cube features five large imprinting areas. Bic Promotional Non-Adhesive Logo Notepad Cube is available with drilled holes for pen (optional).